Missal, in Latin. Illuminated manuscript on vellum, made by the Fraterherren Zum Springborn also known as Brothers of Common Life Ad Fontem Salientem. Germany, Münster, c. 1480. This extremely rare manuscript was made in Münster by the Brothers of Common Life, also known as the Fraterherren Zum Springborn, c. 1480. It was written for use in the diocese of Münster, based on texts devoted to Liudger, first bishop of Münster, missionary among Frisians and Saxons. The manuscript is in its original binding, sewn on five raised bands, blind-stamped pigskin over wooden boards, stamps, on front- and back cover. 390 x 274 mm. – 309 leaves. With 13 blue and red puzzle initials, heights ranging from 4 to 9 lines, with red or purplish-brown pen-work decoration touched with green. Inserted leaf prefacing Canon: 1 full-page miniature depicting the Crucifixion. One of the very few liturgical books from Münster that survived the centuries! This is a carefully organized, finely written and decorated Missal from the circle of the Devotio Moderna – still preserved in its original binding. Even the original leather finding tabs, the so-called clavicula, as well as several soft leather reading ribbons, are intact. At Mass, these ribbons and tabs were used to find the important text divisions quickly. Important text divisions are also marked by the puzzle initials, decorated with fine penwork – the largest opens the Missal at the first Sunday of Advent, another the beginning of the Canon text. 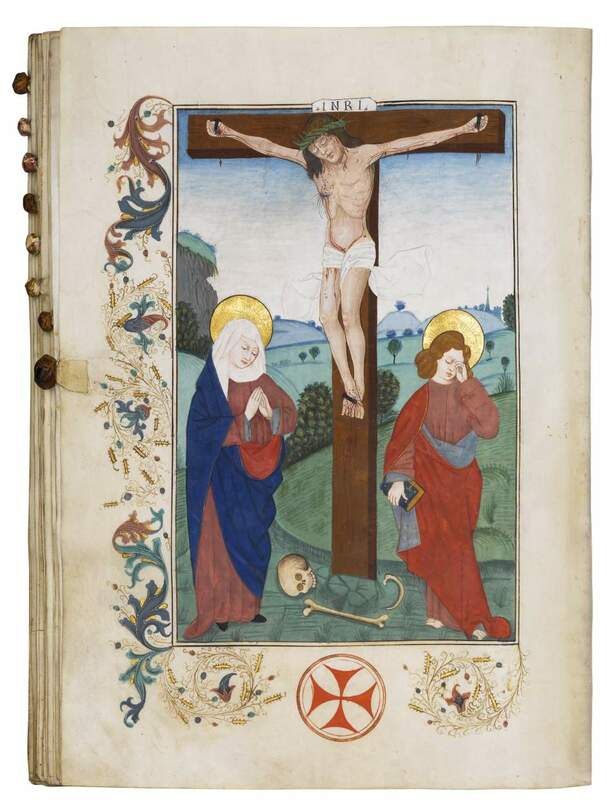 A full-page (inserted) miniature, depicting the Crucified Christ with the Virgin and St. John, introduces the Canon text. The left and lower margins are decorated with gold sprays and painted acanthus, foliate ornaments and balls in a palette of rose, blue, aqua and gold, as well as with sprays of brown hairline stems and gold 'hairy' leaves. Several texts devoted to Ludger ('Ludgere patrone sanctissime'), the missionary who christianized the region and became its first bishop, stand out in this manuscript. The 'most saintly patron' Ludger was of Frisian descent, educated in Utrecht and ordained bishop of Münster in 802. Most captivating is the musical notation at Easter – pointing at a Passion play with a division of roles between A (angels), iii (three priests or 'women') and c (?) (chorus). This was a special Westphalian tradition and several examples of these plays in the region of Münster are known. The manuscript, its decoration and its original binding can be attributed to the Brothers of Common Life in Münster. The brothers earned their living by copying manuscripts and were professional book producers. They followed a general style often used in books made in the circles of the Devotio Moderna. The Devotio Moderna was the spiritual movement of the late 14th century that soon spread from Deventer via the eastern Netherlands to Westphalia and beyond. It was a movement in which books and texts played a major role. Book production by the Brothers in Münster is documented over a period from c. 1425 until the mid-16th century. In particular, the last quarter of the 15th century was its most important and productive period. During the early 16th century, when the Peasants’ War (1524-25) and the rebellion of the Anabaptists (1534-1535) raged over town and region, all came to a halt. This was also the time when the library of the Brothers in Münster was destroyed and lost – making the Missal at hand all the more important!